I love this!! Got me to singing and moving this morning!! I’m so glad. There’s nothing like a good tune to brighten up a day. Enjoy it! The photo and music say it all. Beautiful pairing, Linda. Don’t they work well together? Best of all, we have sunshine again, and only a little rain predicted in the next day or so before a front blows through and brings us lows in the sixties. If it happens, the energy level’s going to shoot sky-high, since the post-storm humidity has been ghastly. We’ll see. Perfect music with which to start to recovery! Very soothing. Work often goes more easily with music, and there’s no question that a little music’s a fine change from constant emergency bulletins and constant stress. I read that evacuation orders have been given for the Sheep Gap fire and a shelter set up in Plains — I just can’t get over the difference in circumstances between your area and ours. We seem to be at the opposite ends of the spectrum! Seven fires in this are are now being worked as a complex of fires with a total of 9,000 acres. It’s anyones guess what today will bring, but my cars were covered with ash and burned wood pieces again this morning. A hopeful post–and well received! Thanks, Tina. We certainly hope we’ve seen the last crisis for a while — at least, until we recover from this one! I thought so. It’s a fine song for folks who’re fixin’ to start fixin’ stuff. I thought it was going to be, “Sitting on the Dock of the bay”, but this fits better – I feel like I’m on the barge. What I want to know is where they got that teal-colored line. I love the look of it against the rusted hull, especially combined with the hard hat. It’s a southwestern desert palette for a southern bay — really unusual, and fun. Now it’s time to be worried sick about Irma. Be safe, GP. I have even protected the stamps already!! The water will have to flood here like Houston before I get worried about everything. Thanks for the concern, Linda! What an uplifting start to the day! Thank you Linda. It’s not a bad song for closing out the day, either. I’m glad you enjoyed it. I was surprised when it came to mind, but it seemed perfect. So much WORK to do, but remember, Rome wasn’t built in a day. At least the rains have ceased for a spell, the hurricane has passed, and now the rebuilding can get underway in earnest. I imagine lots of people are tired of being house-bound — or shelter-bound — and are more than ready to tackle the tasks ahead! In truth, the rebuilding will have to wait just a little longer. First, the rivers have to come down, the reservoirs and bayous have to recede, the insurance adjustors have to show up, contractors have to be found… And on and on. It’s such a long process, but it has started. The number of people in shelters is declining, and businesses are opening up. In fact, I can report that the Mediterraneo Cafe across from NASA is serving their wonderful Greek food again, and the belly dancer is attractive as ever. It’s not all gloom and doom around here! That’s so true, Dina. Take things a day at a time, but if a day’s too much to handle, take it by the hour. And when even that overwhelms? Well, a minute isn’t so long, and before you know it, you’re into the next one. You would have laughed at my cat. For two days and two nights before the storm’s arrival, she did nothing but prowl the house, uttering low, unearthly moans mixed in with howls. After the storm began in earnest, she made for her chair, fell asleep, and didn’t do anything but sleep for hours at a time. She wasn’t the least bit interested in the birds outside the window. Her loss! Most appropriate song for your area at this time. I always think we appreciate sunshine and a beautiful day even more after a storm, or violent weather pattern. Hope you are able to get back to work this week. Seeing the sun after five days of continual rain was wonderful. I think we do appreciate it more after storms. It’s rather like beginning to feel good after being ill for a time. You don’t quite realize you’re recovering, until you suddenly realize you feel just fine. I’m not working tomorrow, since it’s a holiday and people will be on their boats, but Tuesday morning it will be back to the routine — thank goodness. Beautiful photo. And for us it has been a bright, sunny day. Good to know the recovery is beginning. I’m really fond of this photo. The colors are wonderful, for one thing, and the fellow’s pose brought back some good memories from the Hurricane Ike cleanup. There were some experts in charge of marina cleanup who were admired by everyone. Here are a couple of them. The recovery is well underway. It will take time for everyone to find new housing, for insurance claims to be settled, and so on. But people have gotten after it, and the piles of debris at the curbs are increasing in size daily — as they should. The first task is to get the water and the soggy belongings out of the house, along with any wet sheetrock and insulation. Then comes mold and mildew prevention, and…and…and… It’s a long process. Thank goodness we’ve had a string of sunny days. It helps in any number of ways. On CNN last night I saw a family doing exactly as you describe. Amidst such sad scenes I appreciate your beautiful photo all the more. That song certainly communicates relief! I’m glad. I love the pose you caught this man in, and the light on the water. Wow, what a tense time for you. It’s so hard to get a clear perspective on the storm from far away, depending on news coverage. One thinks everyone is under water, then you see that’s not the case, and I see you’re (maybe?) starting to get back to normal, but I know people are all the way up in Dallas taking shelter. Crazy. Relief, and a readiness to move on. There are things that have to be done, and pretending otherwise would only complicate life down the road. There’s no pleasure in the clean up, but without it, no rebuilding can begin. Things are getting back to normal. 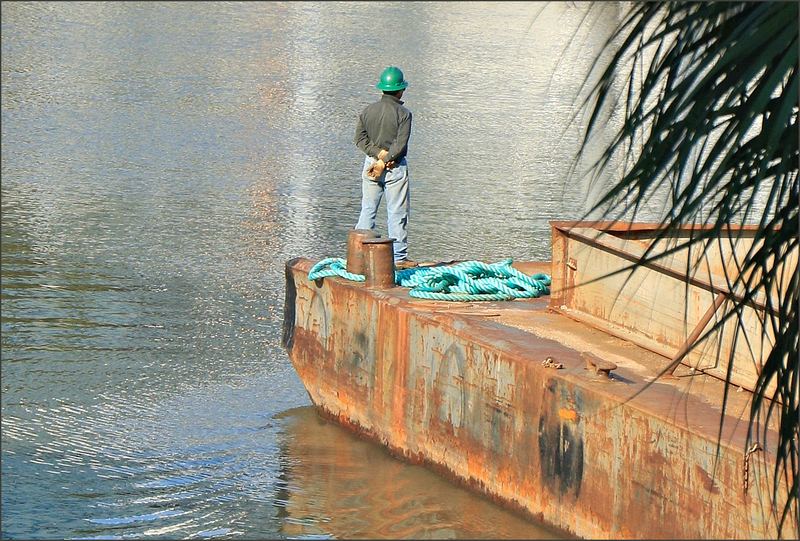 The fellow on the barge was working (don’t you love that blue hard hat and line? ), and tomorrow I’ll be back to work full time. In another week, all of the schools will be back in session, and many who had to evacuate will have found temporary housing. But there’s still a new feeling around town. When I left the grocery store tonight, a cluster of people were standing in the parking lot, looking up at something. When I asked them what they saw, one of the guys turned around and said, “Look at that sunset. Isn’t it beautiful?” And it was. A coda, I guess. Moving forward is good. I think I said it before, but it’ll be interesting to see if you notice any odd changes in your environment after all of this – I’m sure you will. It’s “Gonna Be a Bright Sunshiny Day” has always been a favorite and I had not heard the song in many years. I can’t even remember who the artist is singing that memorable song. The music has the beat and I love that. But I do know that you have an uncanny ability to find songs and or music that fit perfectly with what ever you have written. If I might be so bold, how do you get the music into a post with only the one bar thing showing and nothing else. Is it hard to do? Does it take a computer whiz? Johnny Nash wrote and recorded the song in 1972. This is his version. Other people have recorded it, but I like this version best. It’s a happy song, but not sugary or sentimental, and that makes it a good fit for the days after a storm. It’s very easy to insert music this way, but there are a few steps. I’ll send an email tomorrow with a step-by-step of how I do it, and some alternatives from WordPress. I know they’ve made some changes, so I want to look at their instructions again. Thanks for Nash’s name and take your time with instructions. Thank you. I like your choice of music. Very apropos. When we ate at The Monument Inn at San Jacinto right next to the Houston Ship Channel) we watched the barges go by in style (which is to say with a plate of fried shrimp in front of us) through the panoramic windows of the restaurant. Isn’t that a fine song? If you’re fond of barge and boat watching, you can find even better seafood (in my humble opinion, of course) at the Stingaree restaurant over on Bolivar Peninsula. It’s right on the ICW, and offers some great views. Not only that, you get to throw in a ride on the Bolivar ferry for free. If you’re not going to be down for a while, no problem. Click on the webcam link on their page, and you can watch the boat traffic from the comfort of home. I am curious whether the Stingaree escaped with no damage. It seems so, from their page. The Monument Inn had some damage, but apparently it’s not too bad. I love the colour of that rope. Everything else fades into the background! Isn’t it pretty? Red and blue are common colors for line on pleasure craft, but I’ve never seen this color, and certainly not on an industrial barge. It does steal the show! I do wonder whether the fellow color-coordinated his hard hat. If he did, more power to him. We’d left our car near IAH before flying off to Calgary three weeks ago. I was relieved yesterday afternoon when I could see clearly that the car was still high and dry. I was the opposite of relieved to see late-afternoon rush hour traffic in Houston that delayed our arrival back in Austin by a good half-hour. A half-hour delay? You should count your lucky stars. The west and northwest corridors were hit especially hard by Harvey, and traffic has been miserable. Monday of this week the West Beltway finally opened in both directions, after having a section rebuilt. Two and three hour commutes have been common, given that the 610 Loop, the Beltway, highways 6 and 99, and interchanges all over the city were impassable. For nearly two weeks — maybe ten days — there was no way to get onto 290 without going substantially north, and no way to take a southern route, since almost every state and county road in Brazoria County was underwater. I’m really glad you didn’t have to come back into the middle of all that. At least traffic is moving again, however slowly — and you made it home safely. That’s what counts. After I was already stuck in traffic, it occurred to me I should have gone north from the airport, then cut west to 290. Speaking of 290: it was slowly being converted to a freeway when I first visited Houston in 1976. I think it’s been under continuous construction over the 41 years since then. They say the past is prelude, so I don’t believe I’ll live long enough to ever drive on a finished 290 in northwest Houston. As with 290, so with the Gulf Freeway. When I arrived in Houston in 1973, it was under construction. When I drove into Houston yesterday, several entrances were closed because of construction, and traffic was restricted at several other places because of — you guessed it — construction. I’ve never seen I-45 South not under construction at one point or another, so my sense is that neither of us ever will drive on those completed roads. A very appropriate song for the post, and the entire coastal area was surely basking in the clear skies. I’m thinking that your skills will be in high demand as people start putting their lives – and boats – back in order. I hope that this next month of ‘hurricane season’ goes easy on all. Strangely, the boats here weren’t affected at all: not like they were in Ike, and not like those in Rockport and Port Aransas were this year. Harvey’s landfall really tore up the marinas and boating industry down there, although a little fishing seems to be going on now. The biggest offshore race of the year, the Harvest Moon, is going to have to be restructured, because the tradition has been to sail to Port Aransas and back. That won’t be happening this year! That’s like the annual San Pedro/San Pablo festival in Jama. They did not have it the year of the earthquake, but it was important to the locals and helped bring up the moods of many this past year. And yes, they danced! I hope that the Harvest Moon race will be a good one, wherever they start and finish! It’s still going to be an offshore race, but will start and end in Galveston. It’s a good solution.